Just to keep you up to date on our ongoing processes, here is a recap of what we did last week. First, all throughout last week the people from SBC dipped us into their secret sauce. What this means is that we had a lot of speed dating sessions with SBC-mentors. We got so much input that our heads were smoking. To have experienced people with whom to bounce ideas back an forth was really valuable, however. Now we need to process everything and start to integrate it into our work flow. Second, customer development is an important topic for us. So two of our team members, Benjamin and Florian, went out to the streets to talk to the people who use smartphones and find out what is important to them. One young gentleman from Spain was really adamant about creating an app that let’s you rate clubs in Berlin. It sounded like an interesting project, but it is not our primary concern right now. Third, we are always looking for further applications of the underlying technology of shoutr. Therefore, we have decided to explore the possibility of developing an SDK for designers of mobile games. Think how great it would be to connect gamers on the train or the subway with a steady WiFi-connection. This would be perfect for multiplayer games, such as racing games. 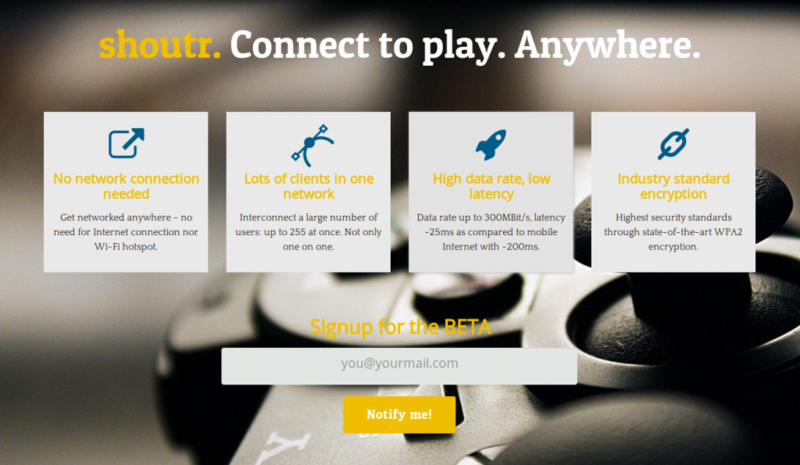 Any developers that are interested can sign up to try our exclusive beta. To make first contact with people from the games industry Benjamin and Christian went to the Berlin Mini Game Jam on Saturday and actually put together the beginnings of what sounds like a really interesting game, Diplomatic Desert Crisis. One of the participants wrote a short blog entry about it. And lastly, to get better insights into the games industry Sebastian and Florian will be at the Gamescom in Cologne, Wednesday, August 21. So if anyone of you is at this event, drop us a line and we can have a chat.